Today, only the eldest inhabitants of the Danube Delta recall that the river froze nearly every winter; since the second half of the 20th century, Europe's second-largest river has only rarely frozen over. This is due to the rising winter and water temperatures in Central and Eastern Europe, as a German-Romanian research team recently determined. Their analysis has just been published in Scientific Reports. In the Romanian harbour town Tulcea, the Danube Commission has maintained an ice diary. Since 1836, the organization has recorded every winter in which the river froze over, how long the river was covered by a solid sheet of ice, and the day on which the ice began to break up. Until roughly 70 years ago, the ice archivists reported ice cover almost every year. But since the middle of the 20th century, the entries in the column "ice" have become few and far between: between 1951 and 2016, Europe's second-largest river only froze over 10 times. Mathematically speaking, that means fewer than one in six winters. A comparison with regions farther upstream shows that in Tulcea, the entryway to the Danube Delta, the river freezes longer and much more frequently than in Budapest, Hungary, for example. A German-Romanian research team has sought to determine why. "When climate researchers talk about ice and global warming, most people think of the Greenland Ice Sheet or the sea ice on the Arctic Ocean. Most of them don't realise that the amount of winter ice on Europe's seas and rivers is an equally important indicator for a changing climate," explains Dr. Monica Ionita, a climate researcher at the Alfred Wegener Institute, Helmholtz Centre for Polar and Marine Research (AWI). Another reason why the Danube no longer freezes over is the inflow of wastewater and heat. Ionita says, "From 1837 to 1950, the winter temperatures only had to drop to minus 0.54 degrees for an ice sheet to form on the Danube. But since the early 1950s, such a light frost isn't enough; today, the air temperature has to dip below -1.05 degrees for the surface to freeze over. As such, we can clearly see the results of human influences." For those engaged in shipping on the Danube, the lack of winter ice is a benefit—with no ice, they can enjoy smooth sailing. 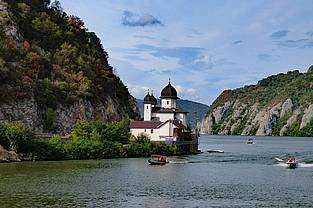 But Monica Ionita warns, "There are likely to be farther-reaching consequences for the Danube's flora and fauna, especially if we bear in mind that, because of global warming, the air and water temperatures will continue to rise."